Inventory We are a resale marketplace, not a box office or venue. Ticket prices may exceed face value. This site is not owned by Agganis Arena . Agganis Arena is home to the 2009 National Champion iced hockey team, the Boston University Terriers. The Agganis Arena box office is located at 925 Commonwealth Avenue in downtown Boston, Massachusetts on the campus of Boston University. The venue has a seating capacity of 7,200 for concerts and 6,221 for hockey games. Agganis Arena opened on January 3, 2005 at a total construction cost of $225 million. Agganis Arena tickets have also included many college men's and woman's basketball games. The biggest event so far in Agganis Arena's history is when it hosted President Barack Obama. The hockey rink is named after one of the most successful college hockey coaches in history Jack Parker. 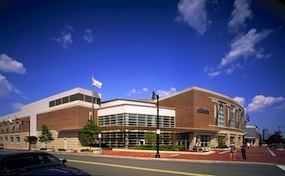 The Agganis Arena replaced the Walter Brown Arena which was located that the Case Athletic Center. In addition to professional concerts and sporting events, it serves as the concert hall for city schools and colleges. The venue hosted a few rounds of the 2007 America East Conference and the 2011 finals of the same tournament. ArenaBoston.com is an independently owned and operated company that concentrates on all sales in the secondary market. We are not affiliated with any official box office, website, or primary supplier. Tickets may be below or above face value and can change rapidly with market conditions. To order tickets to all Agganis Arena events simply follow the steps online or for more assistance pick up the phone and call one of our friendly operators at anytime.